The Alpina A102HG tractor mower is designed for medium sized gardens. Powered bybriggs and strattion 500cc engine, it comes with hydrostatic transmission which allows for easier control in obstructed areas. It’s equipped with a 102cm cutting deck with twin contra-rotating collecting blades for high collection performance. Engaging the cutter deck couldn’t be easier with its electronic blade engagement feature; one simply has to pull the control switch for “On” and push it in for “Off”. It has seven preset cutting heights ranging from 25mm to 80mm which are selected by using the lever located conveniently at the side of the seat. The rear mounted 260 litre grass catcher can be easily emptied from the drivers seat; simply pull the tipping lever and the collector opens wide emptying out the clippings. 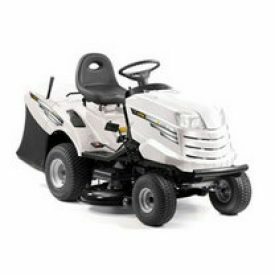 The Alpina A102HG tractor mower also has an adjustable seat provides the driver with optimum comfort. A wash facility on the deck means keeping it clean couldn’t be simpler; attach a hose to the snap-on connector, turn on the water and engage the blades. The cutting deck is equipped with anti-scalp wheels which goes with the contours of your lawn thus reducing the risk of scalping when cutting in uneven areas. The Alpina A102HG tractor mower is also an extremely versatile machine. While all models collect the grass clippings as standard, it also offers additional methods of discharging the grass. Optional accessories include a rear deflector attachment or a mulching kit for recycling. Switching between standard collecting or mulch modes is a simple process; just remove the grassbag, insert the mulching plug into the discharge chute and replace the collector. To return to collection just reverse this procedure. Mulch System Optional Wheel Size Front 15", Rear 18"